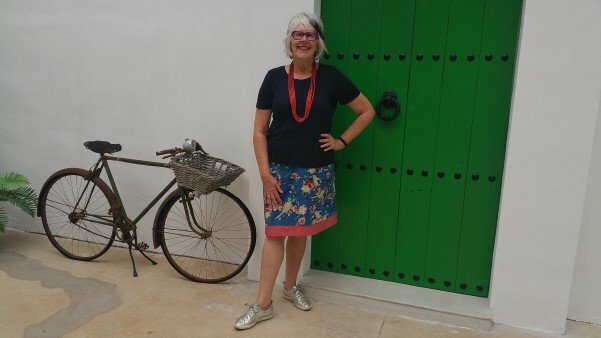 A big thank you to our guest writer today, Jan Wild, who chats aout how she began blogging later in life, and why blogging means so much to her. I guess I could say that words have always been incredibly important to me, so maybe it isn’t surprising that in my 60s I became a blogger. I put that down to a mix of experience, serendipity and craven opportunism an ability to spot an opportunity and pursue it. Add in a bit of good taste (thanks so much to my lovely Mum) and here I am blogging at Retiring not Shy! I have very few clear memories from my childhood, but one that really stands out is my first visit to the library in our small rural town. Right there I fell in love with “The Cat in the Hat”, and with the librarian Cynthia, who opened up a whole broad world for me. What a gift to a grazier’s daughter living about an hour out of town. English was my best subject all the way through school, but I didn’t ever think of myself as a wordsmith, and in fact often felt daunted when faced with the need to write an essay. But my love of language perpetuated through the years of school – from “Avalanche” and “Swallows and Amazons” to “David Copperfield” and “Macbeth”. Words always had the capability of taking me out of myself – something I love to this day. I left school with no real career aspirations, but perhaps the Universe had aspirations for me because, after the holiday job as a nanny, I found myself working in a public library. In a sense I had come full circle from my introduction to Dr Seuss. Work in libraries sustained me for many years, and I completed an undergraduate degree in library studies. I worked mostly in public libraries in Sydney, but also enjoyed a stint as the library manager at Cockatoo Dockyard. Not a lot of carefully crafted words in the Cockatoo library collection, but a whole new world of standards, specifications, engineering and naval history. To say nothing of the history of the incredible convict buildings on the Island itself (but I digress). By the 1980s the impact of technology on library management became very clear; the first automated systems were being implemented and card catalogues were being digitised. I took the opportunity to ‘pivot’ my career, and what followed were a number of roles around technology for libraries. Those roles started with selling services for digitising library records and ended with the introduction of RFID self check and automated sorting systems. It was an amazing time. I also dipped my toe into the broader IT industry in the 1990s and really enjoyed the challenges that presented. Around 8 years ago we (my partner Rowan and I), retired to Mallacoota in East Gippsland. For the first few months I continued to work remotely for my US based employer, but that was always destined to tail off, and it did. Once again, my love of words intervened, with our attendance at a meeting and workshop run by ‘Writers of the Far South Coast’ (NSW), which just happened to be on blogging. In the car on the way home I said to Rowan ‘I have an idea for a blog, I think we should start one’. Talk about out of the mouths of babes, I had no idea at all what I was taking on. I mean anyone can blog can’t they? And of course, anyone can, but the level of sophistication and therefore time commitment, can vary enormously. Well, it was boots and all for me, but I quickly found my boots got surprising dirty and I sometimes found myself in a quagmire of technology. But I knew there was a dearth of publicly available information on a holistic approach to retirement and ageing. If you wanted to know about the financial aspects you would be overwhelmed, but to find information on where to live, what to wear, how to create a fulfilling life in retirement….. there was at the time very little available. So, just over 3 years ago we started our blog ‘Retiring not Shy’ – a lifestyle blog focussed on all things retirement and ageing. It has been, and continues to be, a steep learning curve, but also enormously rewarding. Blogging gave me community when I was living in an isolated location, it has taught me about new technologies and social media, and it gives me a huge sense of achievement when my community finds our information useful. There have been high highs like being interviewed by 60 Minutes on superannuation policy changes, and low lows when I found the site had been hacked. Learning to navigate the ever-changing policies on privacy, search engine optimisation and a thousand other things has at times made me question whether or not to go on. Almost immediately at that point, something wonderful will happen and give me the impetus to keep going. So here I am today, still not a wordsmith in the best sense of the term, but still using and enjoying words as a way to connect to and create my space in the world. How lucky I am.